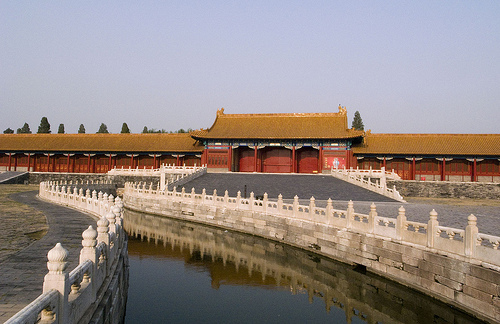 Entering the Meridian Gate, there are five marble bridges on the Inner Golden Water River, shaped like a bow. The five marble bridges look like five arrows reporting symbolically to heaven. The five bridges were supposed to represent the five virtues preached by Confucius-benevolence, righteousness, propriety, intelligence and fidelity ( propriety: correct behavior, good manners, politeness, ceremony and worship). The inner river is 2, 100 meters long and runs from the moat outside the Forbidden City on the northwest, to the moat outside the Forbidden City on the southeast. The function of the Inner Golden Water River was for draining the rain water away; fire prevention; construction on the Forbidden City: Fengshui and the aesthetic architectural design.